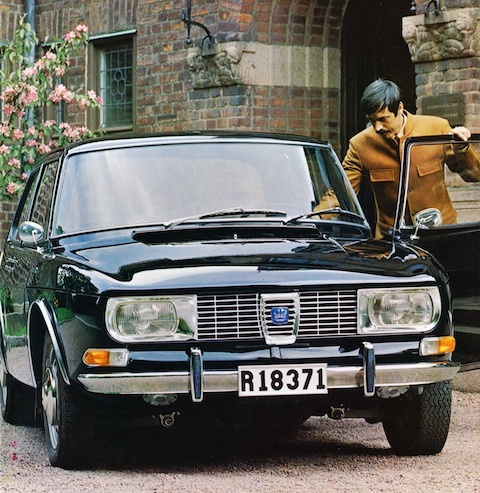 “The new Saab 99 tested”. In this transcript Archie Vicar samples what is now viewed as one of the top-ten great Saabs. Is it more than the anti-Volvo? When people think of Sweden and Swedish cars, they often think of Volvo who make sturdy machines capable of withstanding the horrors of the Scandinavian climate. But it’s worth remembering that Sweden has a second car maker, Saab, who also make fighter jets. Like our friends at Bristol, Saab use the experience they have gained in aerospace to inform the design of their cars. This rare combination of aerospace expertise and the tradition of Swedish quality means that Saab is in the very fortunate position of having some great strengths to play to when fighting in the export market. It also means their cars are expensive and strange. In these increasingly competitive times, such advantages are of no small significance. It was thus with a sizeable sense of anticipation that we packed our suitcases and travelled north to Sweden to examine the new 99, which for this journalist is a far call from the mundane world of Austins, Hillmans, Triumphs and Wolseleys that constitutes our routine work. Most of the drivers of such cars don’t even know that Sweden makes cars, much less know that of the two makers, one is an exciting, lively and original firm and the other is Volvo. The 99 was first shown in 1967 but it is only now in September we have had a chance to find out how startling the car is. First, the bodywork. The little 99 has been given a striking and wholly rational appearance. It gives the flavour of an aeroplane on four wheels. For anyone used to the upright shapes from Morris, Humber and even MG, this will be a refreshing alternative. The windscreen is wrapped around, reminiscent of that other aerodynamic but annoying car, the Citroen DS. Sitting in the 99 one feels very much as if the view out is unimpeded and this car surely presages better and better forward visibility if other manufacturers take note, as they surely will. The lines of the car are neat and there is little exterior decoration. The bodywork shows some subtlety of sculpting that the men at Volvo could only dream of. A nicely shaped clam-shell bonnet opens forward and serves to avoid creating the kinds of rust traps which bedevil the cars from other makers (especially Vauxhall who seem to specialise in this area). A jaunty little vent adorns the otherwise spare flanks of the car, sitting just under the rear pillar. It looks like an aerodynamic car and indeed it is, according to scientific measurements of this by the company itself. Inside the car, nothing has been left to convention other than the roundness of the steering wheel. The ignition key is located between the front seats so as to reduce the chances of injury. A small light illuminates the ignition itself, which is a remarkable idea. The seats are of a quite novel design (they recline and have extra height to allow the driver to rest his head) and the ventilation system is cunningly conceived and very effective. It is also quite simple. Again, it brings to mind the kind of cleverness deployed at Citroen but built to a standard unimaginable in Neuilly. A spacious rear seat, trimmed in hard-wearing material, leaves space for three. The luggage compartment was commodious and we were able to force Land-Windermere inside to prove the point. None of his photos came out as it was too dark. 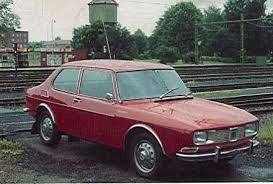 Since Saab is the opposite of Volvo, the power goes to the front wheels. This otherwise regrettable arrangement suits the snowy conditions that prevail in Sweden. When it is not snowy, the Swedes are, of course, not driving but writhing together in various states of undress in the few brief moments that constitute their short summer. The car runs on a 12 volt system. A diagonal split braking system (with disc brakes) is another sign of Saab’s innovative approach to safety. The fuel tank holds a reasonable 10 gallons or so, enough for a touring range of about 300 miles. 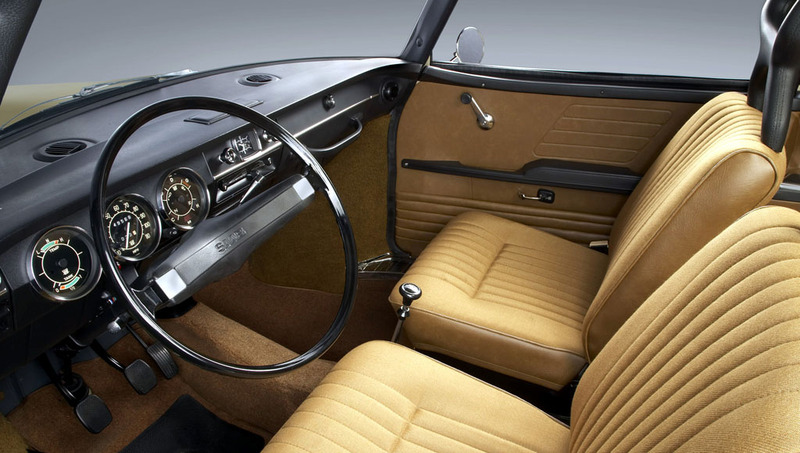 To drive, the Saab is a light and adaptable machine. At speed, the steering lightens somewhat and it yields much information to the driver. Being so aerodynamic and so light, the car makes good use of the engine’s modest horsepower. 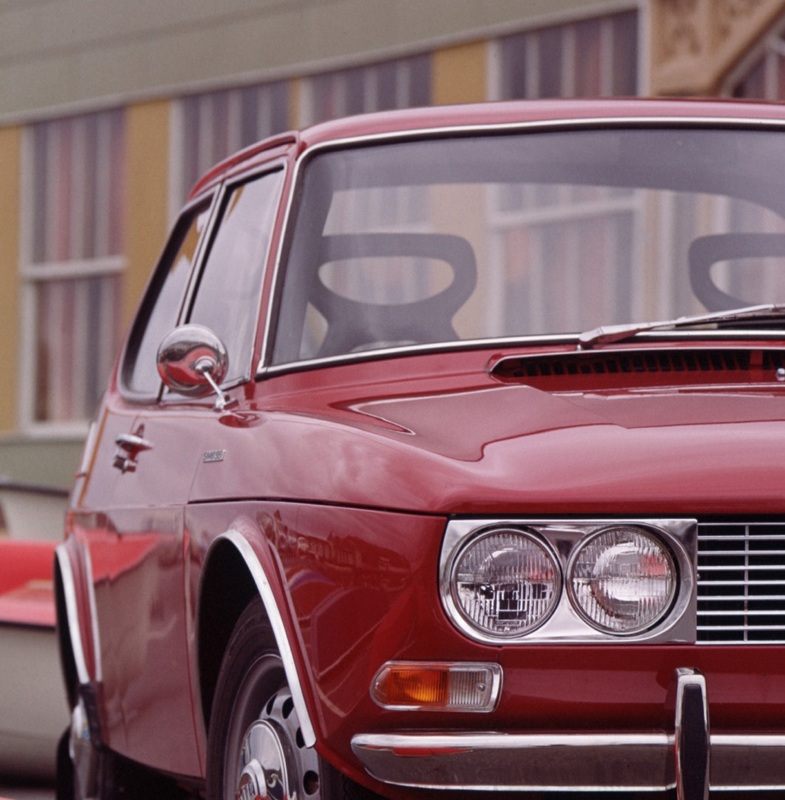 The Saab 99 shows tremendous potential for development and is very different in flavour to offerings from Lancia, Alfa and Citroen, those other cars for men with exotic tastes. The general engineering set-up of disc brakes and front-wheel drive in a monococque chassis has been honed to good effect. The empty roads around Trollhattan afford numerous opportunities to assess the modest understeer, excellent grip and high level of comfort afforded by the 99. It should be noted that it took a fair amount of provocation to unbalance the car meaning that the performance can be enjoyed up to speeds well above the norm prevalent in England. That the 99 is comfortable, well-made, satisfying to drive and well-equipped ought to mean that other makers should pay careful attention. Triumph of Coventry and Alfa Romeo of Milan also offer small and rapid saloons. I would contend here that Saab has the advantage of them, and should Saab choose to fit an even more powerful motor, the 99 could be a class leader in a short space of time. This is a car that could upset the applecart in a most profound way. Deliveries to the United Kingdom begin next year. Rubberised floor-mats will be available in 1972. Good fun this, thanks. To respond with a more serious point, reading this, and catching sight of one of the last of the line 9-5s recently, has made me realise that I miss SAAB … quite a lot. I even had strange, financially and practically near-suicidal thoughts of one of those 9-5s being a potential replacement for the C6 (am I the only one amongst us who restlessly plays the deeply unsatisfying, self-torture mind game of “what would I buy next?”). Obviously, the marque became an unsustainable commercial disaster (what “mass producer” can survive on only 2 lowish volume, nichey models? ), but surely someone could have made a decent fist of managing it within their portfolio, even if GM couldn’t? VAG comes to mind (are they still known by that TLA? ), or, here’s a curved ball, PSA (instead of trying to create a new “semi-premium” brand out of – errrm – DS)? SJ. You’re certainly not alone, and I’ll trump you for fickleness. After you managed to turn me against the Cactus, I started looking at a Twingo. However, having seen Eoin’s news about the XJ’s declining sales today I suddenly thought ‘I wonder if they are becoming the bargains for the self-employed gent with pretensions on a budget that big Jags have always been?’. Next wee I’ll start looking at Hummer prices. There is something very satisfying about the Saab’s appearance. It seems as though the designers have taken a lot of care looking at what you need, and no time at all looking over their shoulder at what Detroit, or others were offering that year. As to C6 ownership, I entered it eyes-wide and actually, nearly 4 years down the line, it’s not as hairy as I feared (things did not start well when the suspension height control failed when I got the car home for the first time!). I’ve had quite high maintenance costs, and the odd part (suspension) fail sooner than I would expect from other cars I have owned (my last car was a Subaru Legacy – so I was spoilt). Obviously, they are all getting on a bit now, but £6k will get a decent early example and the most expensive is around £10k (or £11.5k for a super-rare, very late model 3.0 HDI, of which I believe there are less than 20 in the UK). Although it’s not as out-there as previous big-Cits, it is still an alternative driving and ownership experience in a very conservative class. I enjoy it, for all its (many) imperfections. Hi (again) I have just looked at your website – given the phone number, you must live in my area … small world! I hope your excellent looking enterprise keeps you and yours in health and comfort. 2. Very difficult to get hold of and will be expensive. I source and re-manufacture (through suppliers) many components for the older SAAB relying on my initiative for when I find I have an issue. If I have an issue – someone else will and approx 60% of my business is export. Sent 2 packages to California this morning. Thanks for taking a look and for your comment! I have to agree the C6 is more interesting but I´d have a hard time living with the disappointing package. For such a huge car the interior is oddly cramped and the boot is too small. The CX and XM were both elegant and supremely practical. Sometimes relying on good looks means laziness in design. I do however respect those who opt for the C6 as it is a completely viable proposition for 95% of what most cars are asked to do. I do however like a car that goes the extra mile and the Saab seems like it´s comfortable, durable and roomy. I have even grown to accept the odd styling flaw. Back on track of your very good website. This 99 review is excellent, the writing is a breath of fresh air from the usual PR inspired and sales motivated writing I have come to expect from more recent publications. We are glad you like the content. That’s gratifying. The best response is just to spread the word to anyone else you think might be interested. I think there’s a bit of a gap in the variety of automotive websites which this fills. We’re not a single-marque site and we don’t focus on news. Car magazine used to do essay-style writing and now they don’t so we are having to create it ourselves! That link is now defunct. I’ll have to link to the Archive here. I have seen a few Bentley T2 adverts referring to Archie Vicar’s tour of Sicily.